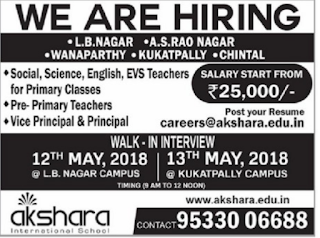 Akshara International School, Hyderabad has advertised in THE EENADU newspaper for recruitment of Principal/Vice principal, Teachers jobs vacancies. Interested and eligible job aspirants are requested to attend interview on 12th, 13th May 2018.Check out further more details below. Name of the School: Akshara International School, Hyderabad. About School: Akshara Group of Educational Institutionsunder the aegis of Akshara Educational Society established its first school in the year 2010.Akshara Group of Institutions has more than 20 years of rich experience in education sector, with world-class and reputed educational institutions in strategic, responsible and managerial roles. Akshara Group has started its operations in 2010. Within the short span of 6 years Akshara is a brand known for quality education, best-in-class pedagogy tools, blended curriculum, state-of-the-art infrastructure, world-class facilities, etc. In the year 2010 a major breakthrough when they entered their long term passion, Education, Aimed for a vision of enhancing the number of Schools to 25 by 2020 with a total student strength of 25,000.